The M50 crossing and the photo opportunity were of course planned for months and the Gods smiled on us that day. Overnight was at Ashtown, below Lock 10, a really bustling spot and a venue for a festival shortly which should go down well locally. Another great place to stop on the Royal. Friday morning we travelled on with a special guest - Noel Spaine, who of course rejoices in the Royal getting some traffic. A very pleasant overnight below Cross Guns Bridge with a 7.30 start arranged for "bridge lift morning"
The flight along the walls of Mountjoy towards Drumcondra Road is particularly pretty in the urban setting. Lock two under Drumcondra Road is a real strange affair. Along the next level towards Jones Road and the monumental Croke Park Stadium. Under Tom Clarke Bridge ( 500 m's from our front door ) and along Charleville Mall, to tie in above Lock 1 and await our turn to go under that bridge. Delayed for a while as the diver cleared debris from behind the breast gate but local banter kept the spirits up. Finally into the lock chamber with some more guests on board including John Mc Keown the renowned WI engineer in charge of the Royal project. Then out to that infamous bridge which worked perfectly for us. These pics from Michael Slevin of Sheriff Street Bridge, leaving the sea-lock manned by WI's Mark Clarke and out onto the Liffey in front of the National Conferance Centre. These final pics on the river from Giles and my thanks to himself and Michael Slevin for some wonderfull photos. 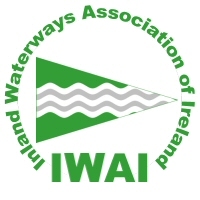 A huge thank you to Waterways Ireland staff who made sure our trip succeeded and of course the skipper who handled our lady and delivered her safely to Dublin. Now back to work!! Joe celebrated his arrival in GCD in fine style by batein into a finely dressed tart...!! Thanks for an enjoyable few days of Doin rovin, Joe....!! Joe's tart, finely dressed with lashings of custard...!! Well done to you and your crew on your Royal trip. Great photos and Narative Joe, well done to all involved. Thanks Joe for a wonderful story told with lovely pictures, some are stunning. Well done on the epic trip. Will drop by GCD some afternoon to say hello. Thanks a million all, I sort of feel that the narrative is very weak as there were a lot of stories to tell. It was easy enough to put up the picture trail especially with the ones given by Michael and Giles. In reality with re-construction work (still ongoing!) and the trip in, it was difficult to find time. We have a lovely little rivetted aluminium run-about to sort for a very hardworking crew member which should help re-pay his commitment. The canal blogs are of interest to people thinking of ditch crawling and in general I try to keep it positive. A few hours lost with a diver working to clear a lock-gate can be frustrating, but the wit and banter at the scene was unbelievable and HEY ITS A CANAL!! I have mentioned the attention and support of WI people throughout and Dublin Branch IWAI also should be thanked. One of the four boats travelling west on Saturday morning was their "Dubhlinn" on it's way to a community event in Ashtown. Surely the true spirit of IWAI in action. Joe nice photos and well done on the trip down the canal have to say it looks easer doing down than going up but only you and ben know that!! Joe did 4E touch the ramp at the back of the GAA HQ that the Rambler came about a foot out of the water. On the third lock any sand and dirt at the rear of the lock where you and I and all had to pull the Rambler though. Will pop down to you in the Grand Canal HQ soon !!! I doubt there will be any more deserved of the Green and Silver Plaque than 4E. Thanks Joe, Ben and Mick, for a memorable few days. And also thanks to WI in Dublin - nobody, at least in their right mind, could ask for a better service. thanks for your praise and it's touch and go whether climbing or dropping in locks is easier - either way if the boat is wide, there are nerves. Des came down and opened that gate on Friday evening so that it worked well on Saturday morning. Just shows it could be done without the "movie-makers" pressure ! No problem with the Croke Park stretch - plenty of water. Ben took a picture of the " mark of Rambler" on the Liffey wall, I'm sure you will see it sometime. A pleasure to have your company over the weekend, your experience is a great asset, yourself Gill and Hobbes have a deal of canals travelled. 4E will know her own way along the Grand ( this the fourth time in Dublin in eleven years ) and we have thoroughly enjoyed our Royal trip. As for her width, an element of danger adds spice to lock work and her dimensions prove it can be done.
" I've got friends in high places"
Just a quick update, we are settled into Grand Canal Basin and the wheelhouse interior is coming along. Next week sees the start of the Dublin Rally and at this point boats from both canals are starting to gather. Great pic blog Joe glad to see you and Ben have landed safely in the basin. I believe the temporary "D4 residents" have also entered the basin. Must drop over sometime soon to see "The Fleet". The time in Grand Canal Basin has unfortunately come to an end after six glorious weeks. The first month was spent finishing the wheelhouse interior ( for now) and deck painting et. etc. a smaller boat would be less time consuming, BUT !!! 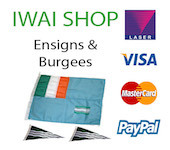 The two weeks of the Dublin IWAI rally have been outstanding and the usual bumping into old friends and aquaintances seemed to happen on a daily basis . Highlights for me were Owen Ganley and Pauric O'Brolochain giving us the tour of the newly re-opened Maritime museum followed by a great evening as guests of the owner of the Martello tower in Killiney. The barbecue in the outer basin was a great night and for the first time ever, our guest for the night was the lovely Jim Murray BBC BSF. The film show night ending with the standing ovation for Ruth Delaney and Ian Bath was an event to remember. The following night a presentation by Dave Mc Cabe on the Dunrovin project was excellent and he is to be commended for a fair and balanced over-view of this venture and the time and patience he has committed to it. Getting back to my mission and the "Roots" story, the winter lay-up has seen considerable progress on what I personally want from this trip which is personalities connected with 4E and their stories. The goal is Healys Bridge near Robertstown and at the point that the now dry Blackwood feeder stretches away from the main line of the canal. As already mentioned this was the point from which Joe Kanes 111B was removed after being purchased for £200 in October 1955. After a re-fit she was re-numbered 4E and travelled to the western end of the Royal Canal on maintenance duties. The three men who worked her there, left many stories and the son of one of them joined us in that area. Joe Kane, a life-long bachelor, passed on in 1963 but nephews of his remained and it is this contact which will fill in the story from the time Joe purchased her in 1935.This coming chapter is eagerly awaited. My friend Vossie has got to use my saying of "feed the machine" when referring to putting up posts and to himself others, I am grateful for some beautiful pictures of this trip. These are shots of the Grand departure, the first a certain M(W&W)F recording the event. This bridge is certainly not for fly bridges or radar arches and for 4E the basin was lowered by a foot ( thanks WI and Mark), our details are 9' 7" high over a width of 8' 0". Pics are compliments of 4B.